After moving to a new state, exploring is on our list of priorities. This should be my first of many posts on the fun, interesting, unique, and family friendly places to visit in Kentucky. Recently, my parents came to visit our new home and I was looking for a place to take my mom and girls while the guys all headed out to a train store. 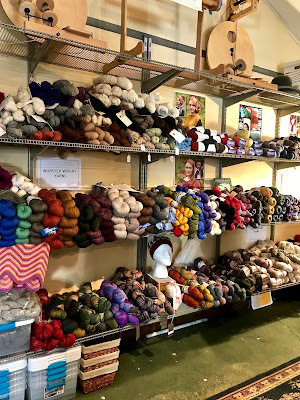 When I looked up Eagle Bend's Yarn and Fiber Shoppe, I knew this would be the perfect place to take my mom who loves to knit. We drove down a bending road and ended at a beautiful farm. Outside our windows, we saw alpacas and chickens, and a tiny yellow shoppe. My mom, of course, was excited about alpaca yarn, but I'll tell you something I didn't expect to happen. All of us became more excited about our visit with the owner, Linda, than anything in the shoppe. Linda invited us in with her 2, playful scottish terriers and immediately made us feel more than welcomed there. She had a shoppe full of beautiful items to share but didn't speak about a single thing in the store until having a welcoming chat with us. She asked questions and really listened to us. She made my girls feel comfortable and they got right to playing with the dogs they met. Linda sees this as an extension of her home and doing what she loves so it makes sense that she would right away make you feel like a long awaited friend. After our chat, she showed my mom her yarns. She explained how the alpaca yarn comes from her own alpacas and she hand dyes it in her kitchen. And the cutest detail (to me) about the yarn is that each skein is labeled and tells you about the alpaca who contributed to your purchase. Linda also has sheep so I bought some wool roving to replace some wool dryer balls that I had misplaced in my move. My girls fell head over heels for these stuffed animals. Their fur is actually made from the alpacas which makes these the softest animals I have ever felt. I'll be sure to head back and buy one for my girls as a gift sometime. They absolutely could not get enough of their softness. And do you see just beyond the animals in the picture above? There has been a whole room created for knitting lessons or social events. It's beautifully cozy in there (and my mom wants to bring knitting with her the next time she's in town to visit). 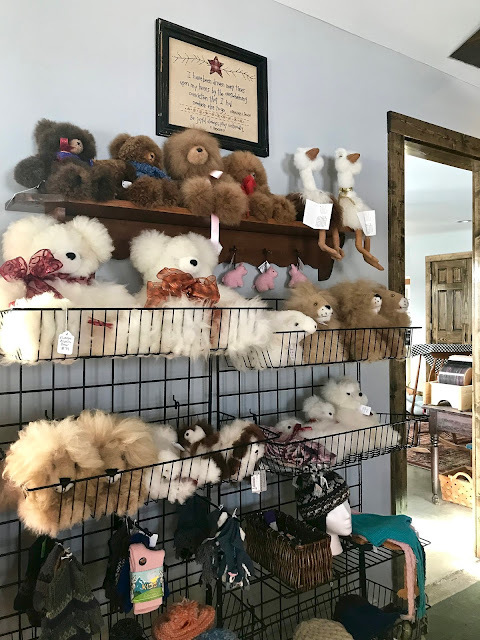 Beyond yarn, the shoppe sells a host of other handmade items. 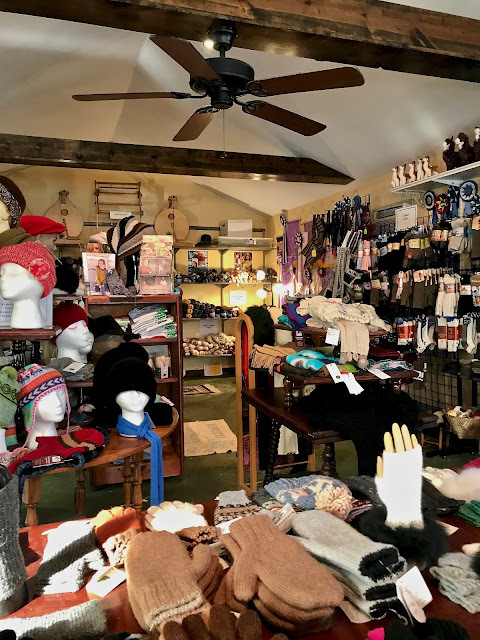 Hats, gloves, fingerless gloves, scarves, and more can be found there. Not one item looked like it was quickly done or cheaply made. Attention to detail is the boast of every single item you'll find there. 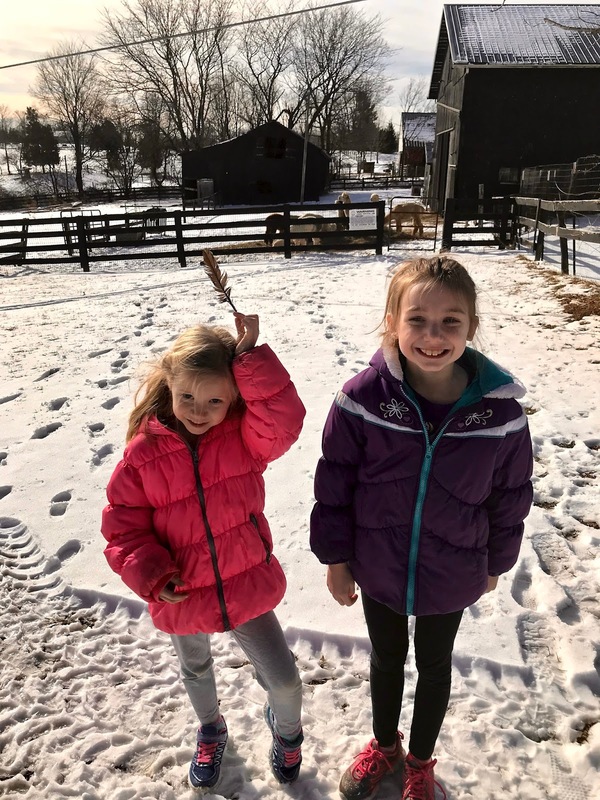 We had the best visit and can't wait to go back again. A super big "THANK YOU" to Linda for her amazing hospitality.